I have perfected taco night. No, seriously. When you have tacos at my house, they are the best. And, yes, I’m totally bragging. 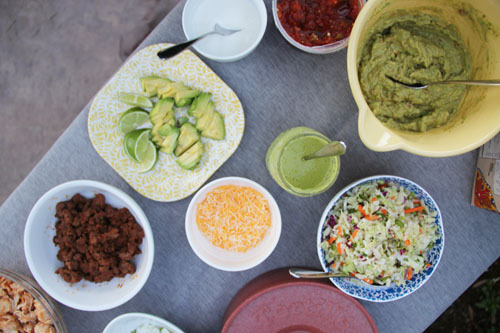 I can’t help it, I am in love with taco night! Let’s begin with a little history. Until I moved to San Diego, taco night meant hard shell tacos, seasoned ground beef, iceberg lettuce, chopped tomatoes, sour cream, salsa and cheese. I’m not saying those tacos aren’t good. They totally are, in fact, that’s Cate’s favorite kind of taco. But when we moved to San Diego many years ago and started having dinner at Maria’s house, things started to change. Maria is a close family friend and she also happens to be Mexican. And, when we go to her house, she almost always feeds us homemade Mexican food. One of our favorite Maria meals is carne asada, corn tortillas, homemade pinto beans and rice, topped with super spicy homemade salsa (of course!). Needless to say, these tacos are quite different than the gringo version I grew up with! 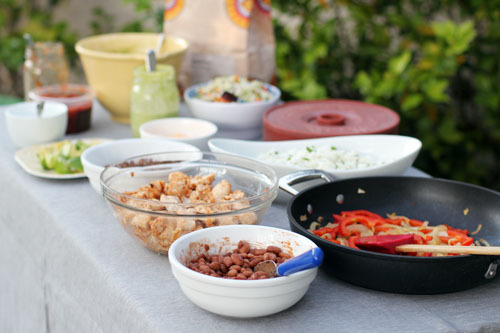 Now, whenever I have corn tortillas and homemade beans, I think fondly of Maria and her kitchen. Corn tortillas: These are my absolute favorite for tacos of all kinds! Flour tortillas: Even though I gorge on corn tortillas, my family also likes to have flour tortillas handy. (Optional) Hard taco shells: It’s good to have some hard shells handy for the pure gringos in the group, like my daughter Cate and my mom Phyllis! Do you have a tortilla warmer? If you don’t, you should get one! I love being able to heat up a bunch of tortillas, toss them in the warmer and have them ready all at once when we dig in. Grilled chicken: Whether you cook the chicken in a grill pan with a bit of olive oil on the stove or on an actual grill, simply salt and pepper the chicken prior to cooking and cook it until it reaches an internal temperature of 160ºF. I like to use boneless skinless chicken breasts and/or thighs. Sometimes, after I cut the cooked chicken into small pieces, I will toss it in a bowl with about a quarter of a packet of taco seasoning. Super yum! Taco Meat: Everybody still loves good ol’ taco meat! I often use a taco seasoning packet but, if I don’t have that handy, I just season the cooked ground beef or ground turkey with salt, pepper, dried garlic, dried onion, chili powder, paprika and cumin. (Optional) Carne Asada: We hardly ever have this because I’m lazy, but it makes for some darn good taco-ing. (Optional) Grilled Salmon: This is another one that we rarely serve on taco night, but when we do it’s delish! 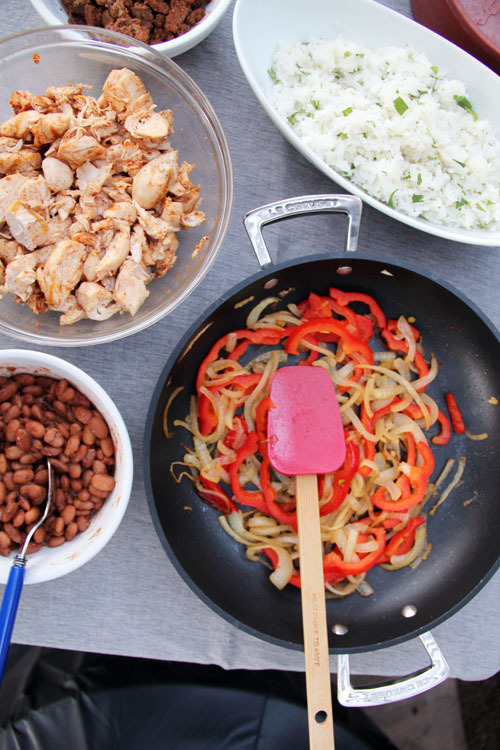 Click here for a recipe for grilled salmon that is flavored perfectly for tacos. 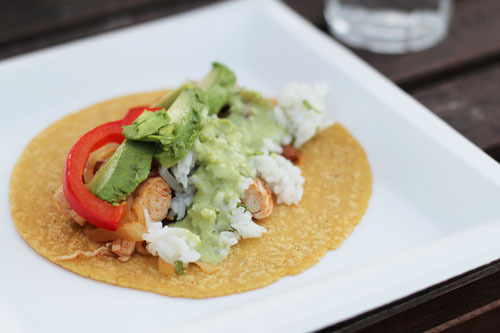 Whether you put the rice right on your taco or eat it on the side, rice is a necessity for the perfect taco night! Click here for a cilantro-lime rice recipe that works great! Beans (pinto, black or peruan are all delish! ): You can of course use canned beans, but homemade beans are really, truly easy to make and TASTE SO GOOD. Click here for recipe. This post was sponsored by Q Squared NYC. You will find dishes from the Heritage line, the Montecito line and the Provence Blue flatware set in some of the photos above. I’ve said it before, and I’ll say it again, I love having Q Squared in my kitchen and that opinion is 100% my own! Get carne asada (and pollo asada) from Ramey’s in Brawley. Nothing compares!! We get it shipped up now that we live in Seattle. Soooo good. This post is making my mouth water! I am DEF making tacos this week for dinner!! tacos are a weekly dinner at our house too. we love chicken and carne asade, and ocassionally shrimp! and, i like that i can start the beans in the afternoon and prep everything quickly, and then put the entire dinner together in the time it takes to cook the rice. easy and delicious! I want to come have taco night and your house. Looks fantastic. What time should I be over? 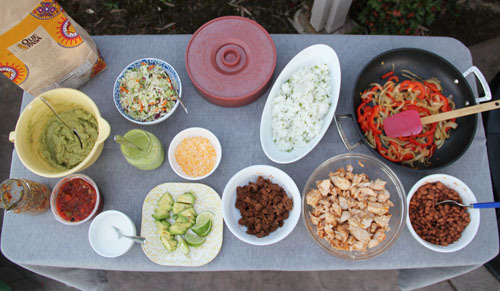 Taco night is the best. I love being able to customize my meal with so many options! Sounds amazing, pinning! I love taco night! I also wanted to recommend the taco seasoning from Penzey’s Spices, if you’ve never tried or used it, we had a Penzey’s store in our neighborhood when we lived in Naperville IL and I got totally hooked. They have a great catalog too. I’m trying to get my family converted to the soft corn tortillas and chicken – we always do avocado/guac, but will definitely give your tomatillo sauce and beans a try! Thanks very much for sharing! PS – I do want to eat your photos. I loooooove Penzey’s and I have not tried their taco seasoning and now I am going to STAT! thanks, jen! We just moved last week from San Diego to the Seattle area. I am already craving good Mexican food, which I’m told does not exist here. We always bought the tortillas made on the spot at the market on ElCajon just off the 805. Or the Mexican grocery store in Escondido..the flour and corn are always still warm and the kids beg to open and have a flour tortilla on the way home. I buy carne and pollo already seasoned at the meat counter and grill it. 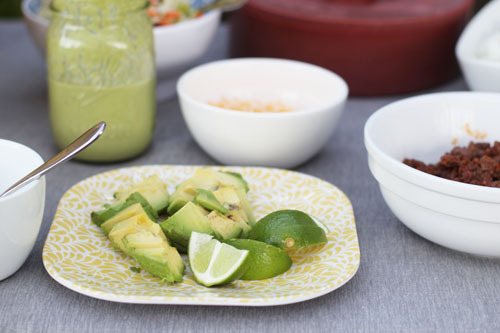 The markets also sell delicious green and red fresh salsas, alone with avocado… your photos are making me drool! oh my, I need to go to these places!!!!!!!!!!! hope your move is going well – happy moving vibes coming your way!